Well, I have less than one week before I start summer school. I am looking forward to teaching and getting more practice in. I picked up the required texts and am going to look them over tonight. I have been unable to post because, first, my own personal laptop was broken by one of my students. Secondly, the L.A.U.S.D. laptop that I’m using suddenly stopped allowing me to post. Well, I was on one of my favorite websites, Ebay, and figured out how to fix the problem. Thank goodness. I’m back. I’m back. I’m back. I can be my usual post-a-holic self. 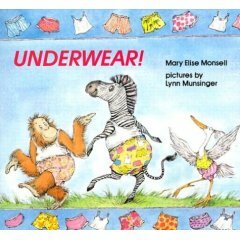 Underwear (1988), written by Elise Monsell and illustrated by Lynn Munsinger is a charming little book. I bought it a couple of years ago for David. He enjoyed it, but Phillise loved it. She thought it was so funny. The title character in the book is Zachary Zebra who did not like buttons or snaps or zippers. But he did like underwear. All kinds of underwear in all colors and prints and styles. His best friend, Orfo the Orangutan, who also loves underwear, is coming for a visit. Together, they go to the World’s Greatest Grassland Underwear Fair and purchase as much underwear as they want. Phillise especially loved the part where they buy all types of underwear- orange spotted underwear, underwear with palm trees and bananas, zebra striped underwear, leopard spotted underwear, and underwear with fish and monkeys…. They have lots and lots of fun, until they run into the unhappy buffalo, Bismark the Buffalo who absolutely refuses to like underwear. Although this book doesn’t teach academic skills, it does teach social skills, like how to get along with others, how to have a good attitude, or even how to be a friend. Follow Zachary & Orfo’s adventure as they try to get Bismark to like underwear. Will they succeed? Pick it up for yourself if you’d like to find out. I am so happy that I found this book, The Hungry Thing (1967), written by Jan Slepian & Ann Seidler, with pictures by Richard E. Martin. It is very hard to find. I found it on one site for $87.00. The cheapest that I found it for was $27.00 on Ebay. I knew that I would find it if I waited and bided my time. Well, I did find it; and for the price that I wanted. I found it on Alibris for $7.99 + $3.99 shipping & handling. I wanted it because I read its’ companinon book- The Hungry Thing Returns- and had to see what the prequel was like. N-e way, on to the review. This book is about a thing- a hungry thing. He suddenly appears in town with a sign that says “Feed Me”. All the adults try to figure out what the Thing wants when he asks for shmancakes… and tickles… and hookies… and gollipops. A young boy provides the voice of reason and figures it out. Children are invited to figure out what the Hungry Thing is asking for. This book makes a great read aloud. It’s also great for teaching and/or reinforcing rhyming. “He’s underfed. Have some bread,” said a lady dressed in red. “It seems to me he’d like some tea,” said a fellow up a tree. “A bit of rice might be nice,” said a baby, sucking ice. There are two sequels- The Hungry Thing Returns & The Hungry Thing Goes to a Restaurant. I have The Hungry Thing Returns, but need to find it in the mountain of books in Phillise’s room. I guess I’ll have to find The Hungry Thing Goes To A Restaurant @ the LAPL. Once I do, I’ll post a review. Got a story to tell, like to hear it, here it goes. All this week is Vacation Bible School (VBS) at my church. I love it. This usually signifies that the school year is over, firstly. Secondly, I get to spend the whole week with my husband and my children. It is so much fun with quality family time. It’s about reconnecting with people you probably haven’t seen all year. It also serves to remind you that time is indeed passing when you realize that the children who used to be in my & Phillips’ class (Beginners, ages 4-5), are now in the teen department. Whew! I finally finished cleaning my classroom. It was such a mess. Firstly, I inherited very messy closets. Nothing was in order. I didn’t know what I had in that closet for a couple of months until I had the time to fully clean them out. When I finally finished, I discovered that I actually had some pretty good stuff in there. Fast forward 2 months before the end of school and you’ll see me messing the middle cabinet up. The problem began when the Principal complained about the stack of papers on my desk. Since I didn’t have the time or the desire to sort those papers out, I shoved them in the closet. Hence the mess in the middle closet. This wouldn’t have been a big problem if I didn’t have to store everything in the class into three closets. Ya’ know what that means? It meant that I had to straighten out the cabinet and do it quickly. I cleaned it and managed to store everything. Boy was that a challenge. Ever since November, when I got the shock and wake up call of my life when I started my first teaching job. I have found out that being an assistant is not the same as being a teacher. If I didn’t know it before then, I know it now. It was a very rude awakening. When I was an assistant, I had virtually no responsibilities. When the bell rang for the day, I left. When school was over at 2:30, I was gone. Looking for me at 2:31 was useless because you weren’t going to find me. Now, when school is out @ 2:30, you can still find me; sometimes until 4:30. Yeah, a big difference I know, but that’s what being a teacher is all about. Putting in the time necessary to achieve mastery and be the best that you can so the students can benefit. I have moved on to the third stage of teaching, which is mastery. That’s where I am now. The survival stage didn’t work for me. That is not a good place to be. I cannot imagine staying like that. I would leave the profession before I would stay there. So, here’s to moving on to mastery!